Pothole accidents are becoming more and more common. 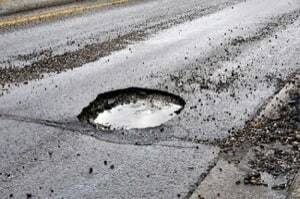 Increased use of the roadways, especially in urban areas of Maryland, causes the cement to erode, opening up holes in the ground that can be hazardous to motor vehicles and their occupants. Sometimes, a pothole can be so deep that it causes a car to lose control, leaving the occupants seriously injured, or worse, dead. Due to the danger of devastating injuries, pothole accident cases may be worth a substantial amount of money. How Good Are My Chances at Suing the State or County in These Cases? Potholes pose a major hazard for motorists, especially those operating on busy roads at higher rates of speed. 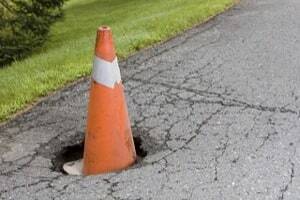 Potholes form due to high levels of heat and pressure caused by the constant flow of quick-moving motorists in heavy vehicles. They can often reach depths of 20 inches deep and 15 inches in diameter and may be worsened by abundant rainfall, extreme weather, and the pounding they get from big rig trucks. If the state, town, or county fails to properly maintain the road, there may be some treacherous potholes. Even small potholes can cause extensive damage to both the vehicle that hits it and the occupants of that vehicle. The condition of our roads has gotten worse in recent years. Why? The downturn in the economy has led to budget shortfalls. In Maryland, things are getting a little better with the economy improving from the ridiculous revenues from the casinos. But we did fall behind. And we have not caught up yet. If you are a Baltimore resident, there have been no real discernable ups and downs. There have always been awful roads. The more potholes, the greater likelihood that there is a motor vehicle accident. There are some ways that potholes might cause severe auto accidents. The potholes themselves may cause the vehicle damage, or worse, cause the driver to lose control of the vehicle, swerving into other motorists. Also, a motorist who sees a large pothole in his way may swerve out of the way to avoid it, and collide with other vehicles. If the weather is inclement and the roads are wet, such a maneuver can have deadly consequences and result in serious injuries and fatalities. In theory, the State of Maryland will pay your property damage claim from a pothole accident. You just file a written claim to the Maryland Treasury Department or call 410-260-7684 or 800-942-0162. Pothole case can be tough. But our firm does handle serious injury and death claims. But here's the catch. Even if you get the claim in within their draconian limitations period to put them on proper notice of a claim (and potentially to file a claim) you must prove that the Maryland Department of Transportation knew about the pothole. Now, this is actually pretty easy to prove if you file a lawsuit and conduct discovery. But that process would cost more than the property damage that you have in the vast majority of cases. We have not seen statistics on how many of these pothole property damage claims the State of Maryland has paid. But the best guess? Not much. The biggest risk of serious injury and death is, not surprisingly, when you are hitting a pothole on a motorcycle. The sudden, unexpected drop can cause even the most careful biker to turn over the bike. At high speed - at any speed, really - this can lead to disaster. A motorist drives over a large, deep pothole and his right front wheel becomes entrenched in the hole, causing his vehicle to spin or flip over. A driver stops short to avoid driving over a large pothole without giving the motorist behind him enough time to stop, thereby causing a rear-end collision. A driver swerves to his left to avoid running over a pothole, sideswiping a vehicle in the adjacent lane. A pedestrian walking on the street or the sidewalk may even step in a pothole and incur serious injuries. Old Highway 27 in Westminister has not been repaired in some time because Maryland's tax revenues are not keeping up with expenses. On a hot summer evening, David decides he wants to take a drive up Old Highway 27, because even though the road is in disrepair, there is fantastic farmland scenery to take in. Sick of the hassle of the city and his stressful job, he throws in his favorite CD, turns up the air conditioning and cruises out of his driveway. He hangs a right at the light onto the old highway and takes a deep breath of fresh country air. As he drives up the old road with the gorgeous scenery, he makes sure to keep his focus on the road. David is a very careful driver and he travels the speed limit while stopping at all traffic lights and yielding to vehicles that have the right of way. He notices that the road is extremely rough and bumpy, but this does not bother him because his 4 wheel drive vehicle has excellent road traction. He proceeds down Old Highway 27 and makes sure to slow down before he goes over any large bumps. As he drives over what feels like a smooth part of the road, he feels a loud thud and his vehicle stops suddenly and is jolted forward. He has run over a pothole and his front wheel is stuck momentarily, causing him to lose control of his car. The accident causes his car to spin out and slide off the road, striking a wooden fence head on. David slams his head against the steering wheel as a result of the impact, causing a large cut on his forehead that bleeds heavily, and a severely injured and bloody nose. He is taken to the hospital and treated for multiple facial fractures. The cause of this accident was obviously the large pothole. Since the state owes a duty to maintain state highways, the state of Maryland is at fault for David’s injuries. The negligence of the state, we would argue, proximately caused David’s injuries and the state should be made to compensate David. Do I Have a Shot of Making a Pothole Caused My Accident Claim? Let's be brutally honest here. First, you are going to have a hard time finding an attorney to handle a "I hit a pothole, crashed my car and now want to bring an injury" claim. First, there are tough claims to make. You are going to face motions to dismiss when you file the case, and motions for summary judgment before trial that are going to try to defeat your claim before it ever goes to a jury. Second, there are notice requirements when suing the state, cities, or counties in Maryland that often means you have missed your chance to file suit. Finally, there are also problems getting the money you deserve because you are almost always suing the government in these cases. The state of Maryland, for example, caps verdicts in these cases at $200,000 with few exceptions. So what kind of cases does our firm take that involves crashes because the road was in poor condition? We only consider very serious injury and wrongful death cases where we believe we can link the pothole or defect in the road to the injuries that were suffered. If you have been the victim of this sort of accident and you have been seriously hurt, you need to talk to a lawyer. 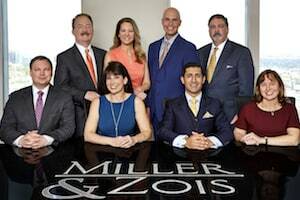 You can call us and we will give you our thoughts on your case and tell you what your options may be. Again, these are hard claims. You have to battle. But, there are real viable claims that come from the failure to maintain our roads. You can reach us at 800-553-8082. If it is easier for you - and it probably is for us - you can also get a free online case evaluation.